What is the affiliation/hashkafa of the Yeshiva? Sha'alvim aims to provide its students with a high level of learning, instilling in them a love for, and commitment to the Torah, people, and land of Israel. As a Hesder Yeshiva, Sha'alvim teaches its students the idels of religious zionism, and includes stimulating tefilot, chagigot, and tiyulim on Yom ha-Atzmaut, Yom ha-Zikaron, and Yom Yerushalayim. After Sha'alvim, students are encouraged to continue their Torah and university studies in a setting conducive to mitzvoth and yirat shamayaim. What kind of relationship do the students have with the Rabbeim? Sha'alvim is certainly known for its warmth. Many of the Rabbeim live on campus, and their homes are open to their talmidim at all hours. The students see their Rebbe as a spiritual guide as well as teacher, and often confide in and consult with their Rebbe about life's questions and problems. 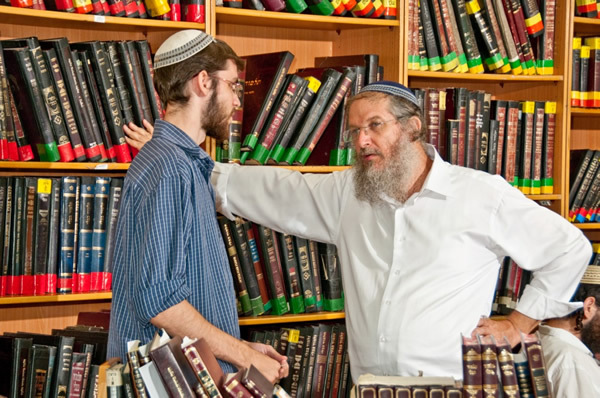 Many students continue this relationship for years after they leave Sha'alvim, and not infrequently has a first year Rebbe had the pleasure and honor of being a Mesader Kidushin years later. Do the overseas students fully integrate with the Israeli students? What then is the relationship between the Israelis and overseas students? The Israelis and the Americans learn together in the same Beit Midrash, go to many of the same shiurim and sichot, and share the same cafeteria and dorms. Overseas students are also invited to attend many of the optional shiurim given by the Israeli Ramim. Every overseas student is also paired up with an Israeli student for a once a week chavruta, which facilitates greater camaraderie between the students. Most of the overseas students cite their desire to be part of an Israeli Yeshiva as one of the reasons they came to Sha'alvim. How are the dorm rooms? The door rooms house three or four students, and are equipped with a private bathroom and shower. Each room is air conditioned with a modern air conditioning system that allows sleeping and "down time" in the dorm to be a comfortable experience. Student's laundry is done for them in Sha'alvim's modern laundry facility. Students drop off their dirty laundry once a week, and pick it up cleaned and pressed a few days later. Dry cleaning services are not available in the yeshiva. How far is it to Yerushalayim? Not close enough to distract students from learning, but easily accessible when the need arises. The drive to Yerushalayim from Sha'alvim takes approximately 30 minutes. If a student needs to travel to Yerushalayim during the week, they generally take the bus, or a taxi. When a number of students are traveling together, such as on erev Shabbat, they often hire a van, which is faster and less expensive, per person, than the bus. What do the guys do when they're not learning? There are many scheduled activities organized by the yeshiva for the overseas students outside of the regular studies (see next question). Sha'alvim has a sports complex, which includes basketball courts, a soccer field, and track. In addition to playing sports and exercising, students spend leisure time talking to friends and writing emails in the computer room. Are there any organized activities besides learning? Yes. There are many tiyulim and Shabbatonim scheduled throughout the year. These trips are planned both for their educational value, and with the intent that students enjoy themselves and come to learn about and appreciate Eretz Yisrael. Many students also participate in the annual Yeshiva mission to Poland . Can you tell me about your graduates? Every year, Sha'alvim is very proud of its graduates. The students leave with refined middot, a passion for learning Torah, and invigorated with a sense of responsibility for klal yisrael. Sha'alvim is proud to report that many of our recent graduates have been recognized for these fine qualities. The highly competitive "masmidim" program at Yeshiva University, which includes a full tuition scholarship and leadership training, accepted more graduates of Sha'alvim than from any other institution. Similarly, Sha'alvim graduates comprise the largest contingency from a single yeshiva in the prestigious Kollel Elyon. As future professionals, businessmen, pulpit Rabbis and Roshei Yeshiva, Yeshivat Sha'alvim is training tomorrow's leaders. How do I know if Sha'alvim is right for me? How do I apply to Sha'alvim? Our online application can be found here. If you are attending a Yeshiva High School, you should talk to your Rebbe or Israel guidance counselor. They are in contact with us and coordinate when interviews will occur.